Jim's Jerky is a brand of Temba Meats based out of Charlton, Queensland, Australia. Read my previous review of their biltong. Beef jerky is still somewhat new in places like Australia, South Africa, and England, who've been more accustomed to Biltong, a similar meat snack with a clearly different flavor and texture. 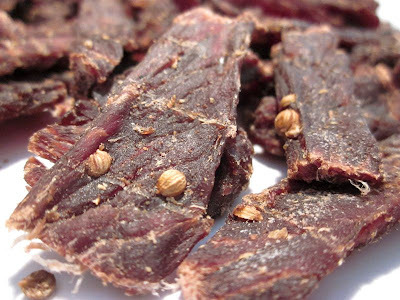 Where biltong tends to spoil more quickly, jerky tends to remain shelf-stable for much longer periods, making it more conducive to the retail market. 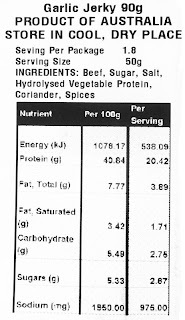 Beef, sugar, salt, hydrolyzed vegetable protein, coriander, spices. The first thing I taste from the surface of these pieces is a moderate saltiness, with a light bit of the coriander seed. The chewing flavor starts with a burst of coriander seed (due to chewing into the seed), and then a continuation of the saltiness, followed by a very light natural meat flavor. For being labeled as "Garlic", it doesn't seem to hold up very well. I'm not tasting much garlic in this. I can taste a little bit of it in there on some pieces, and none at all in other pieces. The level of garlic that I can taste is about the same as I would find in the plain or original varieties of many other brands. Otherwise, the flavor that seems to represent this jerky the most is the coriander seed. In pieces where I don't bite into a seed, I can still taste a light flavor. And then when I bite into a seed, that sharp, pungent flavor bursts out and takes over my taste buds. The saltiness perhaps has the second-most dominant flavor, coming in at a medium level of intensity. There's also a light natural meat flavor, having that dehydrated flavor as opposed to a cooked flavor. I don't really taste much any sweetness in this. Overall, what you're going to notice the most is the coriander seed, with a medium level saltiness, and then a light natural meat flavor. There doesn't seem to be much garlic flavor in here, just a faint bit here and there. Jim's Jerky sells this Garlic beef jerky at a price of $40.00 AUD for a 500g package. That works out to $0.080 per gram. 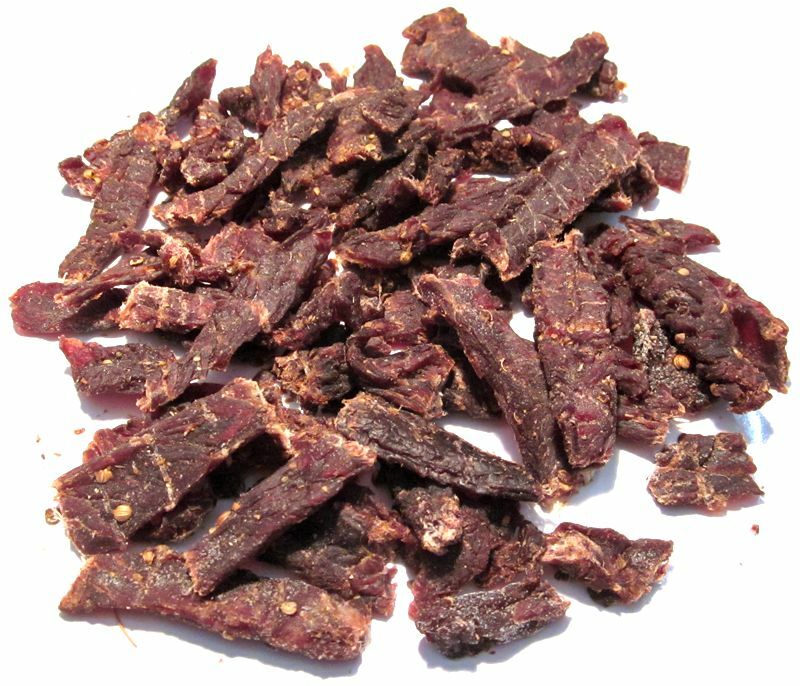 For general jerky snacking purposes, at the $0.080 per gram price, it seems to present a fair value. I'm getting a basic level of snackability due to a less than impressive flavor, average chewing texture, though easy eating and good meat consistency. That price seems to be at the lower end of other Australian jerky brands I've found online, and it's only because of that lower price that it manages to offer some value. As a Garlic beef jerky, at the same $0.080 per gram price, it's a weak value. I don't really get much garlic flavor from this. Even though it seems to be priced lower than other brands, it doesn't quite make up for the fact that it doesn't offer much garlic flavor. 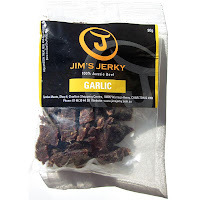 This Garlic Beef Jerky from Jim's Jerky doesn't seem to generate much garlic flavor. I do taste faint traces of in the chewing, but considering this is clearly labeled "Garlic" on the front, I would expect a strong garlic flavor, particularly for those garlic lovers who might jump at the chance to buy a garlic flavored jerky. 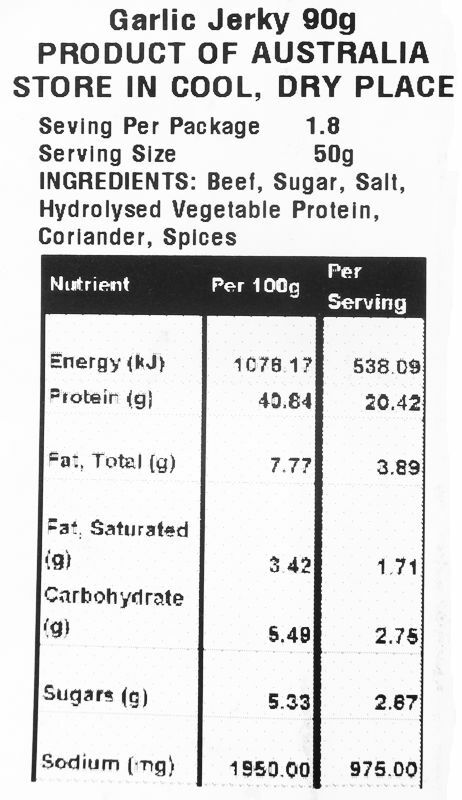 Otherwise what you're getting is mostly the coriander seed flavor and a moderate saltiness. And because of that, this tends to taste very similar to Jim's Biltong, though I found the biltong to have a better flavor and a more snackable eating. Compared to the other 240+ brands of jerky I've reviewed, this seems to sit right in the middle of the pack, not really providing any outstanding flavor or chewing, though still better than many other brands. For my recommended beer pairing, I'd go with a dark belgian ale, just like with the biltong. That stronger coriander flavor in this jerky should pair really well with the slightly acrid flavor of a belgian ale. Chimay Blue, or the Gouden Carolus Classic.